The rollout of the card sparked a storm of publicity about its use last year. 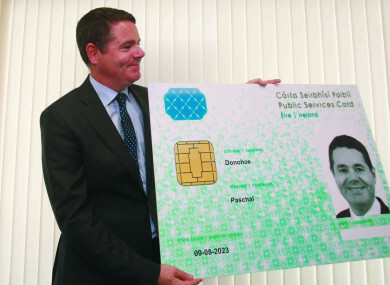 Minister Paschal Donohoe with a mock up of the PSC. THE GOVERNMENT SPENT over €200,000 on a public relations campaign promoting the Public Services Card (PSC) in 2017. The amount was split between two marketing companies for a communication campaign to promote “awareness and benefits of the PSC/MyGovID” according to the reply of a parliamentary question. In total, the Department of Public Expenditure and Reform paid €145,441.83 to Mindshare Media Ireland Ltd, and €59,998.17 to KICK Communications, amounting to €205,440. This is over the estimated budget for the radio and online advertising campaign announced last year. Concerns have been raised over the card becoming a “de facto” national ID card, with many wary that you now have to provide the card to access a wide range of public services. Until recently, the card was used merely for claiming jobseekers’ benefits, but it has since been expanded to encompass all welfare services, some passport applications, and the driver theory test. In the most controversial case, the Department of Social Protection cut off an elderly woman’s pension because she had refused to sign up for the card. However, it was forced to reverse its position under public pressure and the Data Protection Commissioner has now launched an investigation into whether the extended use of the card is fully compliant with the law. Some experts, such as Digital Rights Ireland Simon McGarr, believes that it is not, and has been highly critical of the rollout of the PSC. Queries and complaints from the public, released under Freedom of Information, to two of the main departments involved in the card’s projected expansion (the Department of Foreign Affairs [DFA] and the Department of Public Expenditure and Reform [DPER]) suggest that the government’s communication regarding the card has been less than stellar. Social Protection Minister Regina Doherty’s declaration last August that the card is ‘mandatory, but not compulsory’ did not help matters. Commenting on that statement in a recent interview with TheJournal.ie, the minister admitted her communication about the card was flawed. Email “Government spent over €200k promoting the Public Services Card”. Feedback on “Government spent over €200k promoting the Public Services Card”.